Hi, Mike here with SRQ Computer Services. Offering tips on Computer Repair in Sarasota, FL. There are the traditional methods such as removing bloatware, taking out un-needed startup items, running Defrag and registry cleanings. While this may work to speed the computer up temporarily all it does is mask the underlying problem of why the computer was slow in the first place. Many customers think they need a faster CPU/Processor or a bigger hard drive or more memory, but the primary reason people complain about slowness is due to their Hard Drive. Even the most basic new computers have amazingly fast processors and huge amounts of memory in comparison to 10 years ago, but Hard Drive technology has barely advanced at all since the 60’s. Let’s take a look at this picture. 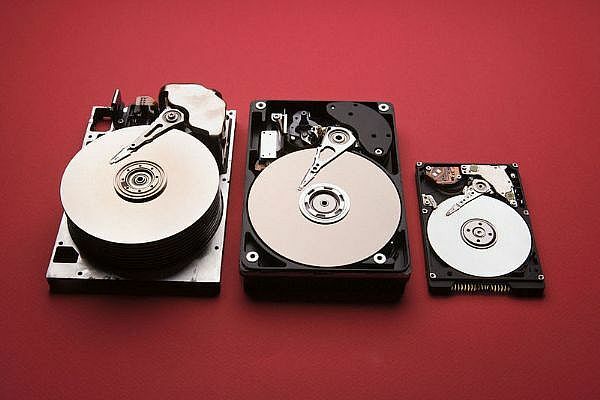 What you see is three Hard Drives, one from the 80’s, one from the 90’s and one from just a few years ago. Notice any difference? Size… that’s about it. Other than size they work the same way as a record player, it’s a large disc with a needle that goes back and forth. Herein lies the problem, while modern computers are going a million miles an hour your hard drive is relying upon century old technology and slowing the whole thing down. It’s like putting old wooden wagon wheels onto a 500 horsepower sports car. It’s not going to get anywhere fast. Whats the solution? Solid State Drives, commonly known as SSD Drives. This new technology has just become popular over the past few years, but is catching on very rapidly. They have gone from being nearly $1000 in price just a few years ago to under $100 for a 128GB model. High end laptops over $1,000 in price typically come with an SSD drive already in them from the factory but many users simply can’t or don’t want to spend that much on a computer. The secret I have discovered to a fast budget computer is that even your most basic Pentium processor in a $350 Laptop is plenty powerful for 90% of users. Add an extra $100 in price for a 128GB SSD drive and you have got yourself a super fast laptop for only $450. A Cost savings of nearly $750 in comparison to models that already come with SSD drives in them. You can even take a 5 year old computer and install an SSD drive in it and the performance improvement is astounding. Performance benchmarks and numbers mean little to the end user, it’s all about how it works for them, and SSD drives deliver. You can expect 15 second bootup times instead of a minute and a half. When you click to open programs they pop up like popcorn instead of waiting and waiting, it absolutely transforms the computing experience. It’s like going from Dialup to Cable Modem Internet, once you’ve tried it you can never go back. Another additional benefit is battery life, SSD drives do not have any moving parts and therefore consume far less battery than traditional hard drives. SRQ Computer Services | Powered by Mantra & WordPress.